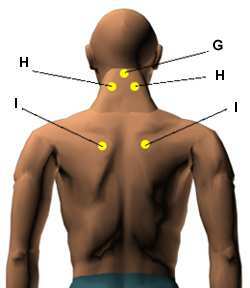 There are the acupressure points for relieving Cold & Flu. Working on these points can help you get better quicker and increase your resistance to future colds. You do not have to use all of these points. Using just one or two of them whenever you have a free hand can be effective. Location: Directly between the eyebrows, in the indentation where the bridge of the nose meets the center of your forehead. Benefits: Relieves head congestion, stuffy nose, and headaches. Benefits: Relieves chest congestion, breathing difficulties, coughing, and sore throats. 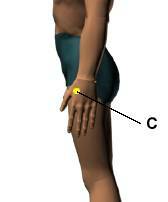 Location: At the highest spot of the muscle on the back of the hand that protrudes when the thumb and index finger are close together. Location: In the indentations of the eye sockets, on either side of where the bridge of the nose meets the ridge of the eyebrows. Benefits: Relieves colds, sinus congestion, frontal headaches, and tired eyes. 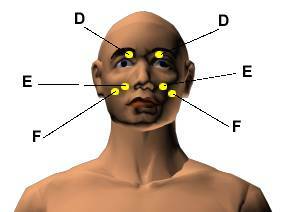 Location: On either cheek, just outside each nostril. Benefits: Relieves nasal congestion, sinus pain, facial paralysis, and facial swelling. Benefits: Relieves stuffy nose, head congestion, burning eyes, eye fatigue, and eye pressure. Location: In the center of the back of the head, in the large hollow under the base of the skull. Benefits: Relieves head congestion, red eyes, mental stress, headaches, and stiff neck. Location: Below the base of the skull, in the hollows on both sides, two to three inches apart depending on the size of the head. Benefits: Relieves headaches, head congestion, arthritis, neck pain, and irritability. 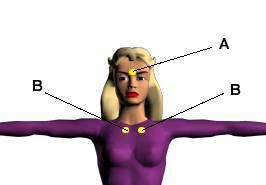 Location: It’s located near the spine, off the tips of the shoulder blades. Benefits: it is especially good for stimulating the body’s natural resistance to cold and flu. According to traditional Chinese medicine, wind and cold enter the pores of the skin at this point.